AOC (Area of Concern). An AOC is “a location that has experienced environmental degradation” ….that’s government speak for “an AOC is a contaminated area”. ARARs (Applicable, or Relevant and Appropriate Requirements). This is a basket term with no specific meaning, especially at Tremont City Barrel Fill Superfund Site where Ohio EPA and US EPA disagree about the meaning of the ARARs they both agree apply. Ohio EPA believes a number of ARATRs apply but US EPA thinks the same rules are irrelevant, and don’t apply. CAMU (Corrective Action Management Units). A corrective action management unit is an area within a Superfund Site that is used to handle wastes during a clean up. Cell. 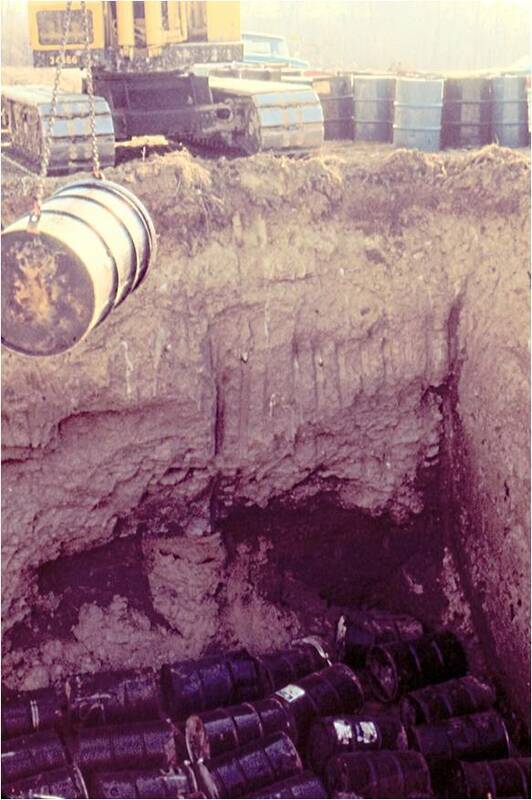 At Tremont City Barrel Fill, specific areas were excavated and filled with barrels of waste then covered with some of the excavated soil. These are known as cells (of barrels of waste). CERCLA (Comprehensive Environmental Response, Compensation, and Liability Act). CERCLA, commonly known as Superfund, became law in 1980. The Superfund law provided broad Federal authority to respond directly to releases or probable future releases of hazardous substances. CWM (Chemical Waste Management). CWM is the branch of Waste Management Inc. that deals with chemical waste. EPA (Environmental Protection Agency). EPA means US EPA. Ohio EPA is always preceded by the name Ohio. FML (Flexible Membrane Liner). Also known as a geomembrane liner, the FML is a HUGE thick plastic sheet that is actually rolled out and thermally glued together at the bottom of the landfill. Extensive monitoring of landfills has shown that all flexible membrane liners leak. The liners are usually covered with several feet of sand to protect them, but driving bulldozers and other huge equipment on top of the sand may be responsible for many of the leaks. FS (Feasibility Study). Based on the site geology US EPA selects a clean up alternative known as the FS. FS 4a (Feasibility Study 4a). Based on site geology, in 2010 US EPA publically presented FS 4a as their preferred clean up alternative at the Tremont Barrel Fill Site. All Clark County Public Officials, the Clark County Combined Health District, and People for Safe Water support FS 4a as the preferred clean up for the Barrel Fill. FSA 9a (Feasibility Study 9a). After publically supporting FS 4a as their preferred Clean up alternative, in 2011 US EPA announced they had changed their mind and now preferred a new cleanup alternative FSA 9a. FS 9a is actively opposed by Clark County Public Officials, the Clark County Combined Health District, and People for Safe Water. NCP (National Contingency Plan). The NCP describes how to respond to releases and threatened releases of hazardous stuff. The NCP established the NPL. NPL (National Priorities List). The NPL is the list of sites where hazardous materials meet the criteria to be listed as a Superfund Site. The NPL is a ranking system intended primarily to guide the EPA in determining which sites warrant further investigation. NRRB (The National Remedy Review Board). The NRRB reviews proposed Superfund cleanup decisions to try to have cleanup plans that are consistent across the country. The Review Board is only advisory, with no authority to enforce changes in cleanup plans. Tremont City Barrel Fill Site is overseen by US EPA Region 5 (Chicago). The NRRB questioned many of the cleanup decisions presented in FSA 9a, essentially agreeing with Ohio EPA. US EPA Region 5 is ignoring both Ohio EPA and NRRB in continuing to use FSA 9a for the site cleanup. OAC (Ohio Administrative Code). The OAC are the rules and regulations that the government and citizens of Ohio must follow. The rules are made by state agencies to comply with laws passed by the Ohio State Legislature. In the case of all state EPA regulations, the state rules and regulations are required by the federal government to be at least as strict as federal law. ORC (Ohio Revised Code). The laws passed by the state legislature. The laws are changed into rules and regulations, known as the Ohio Administrative Code, for enforcement. RAO (Remedial Action Objectives). These are site cleanup objectives. RCRA (Resource Conservation and Recovery Act). RCRA describes the legal ways to dispose of solid waste and hazardous materials. RCRA LDR’s (RCRA Land Disposal Restrictions). These are described in OAC 3745-270. This rule identifies hazardous wastes that are restricted from land disposal and defines those limited circumstances under which an otherwise prohibited waste may continue to be land disposed. RESA (Responsible Environmental Solutions Alliance). RESA is the corporation in charge of the cleanup at Tremont City Barrel Fill Site. The eight companies that originally made up RESA were Delphi Automotive Systems, Franklin International, Motors Liquidation Co. (the successor to General Motors Corp.) International Paper Co., Procter & Gamble, PPG Industries, Strebor Inc. and Worthington Cylinder Corp. Note that Strebor and Motors Liquidation are really not in business, and won’t contribute much if any $ to the cleanup. The 8 companies sued Waste Management to force them to join RESA. The court affirmed that Waste Management should join RESA, and assigned Waste Management a 55% interest in the cleanup of Tremont City Barrel Fill Site. RI (Remedial Investigation). The Remedial Investigation is a geologic and hydrogeologic investigation of a contaminated site. ROD (Record of Decision). The ROD is the official legal EPA decision about how to clean up a Superfund site based on the RI, the FS, and all appropriate EPA regulations. SAS (Superfund Alternative Site). The Tremont City Barrel Fill Site is not on the NPL; it is a Superfund Alternative Site (SAS). The SAS uses the Superfund Alternative Approach (SAA). Addressing the site using other clean up options (e.g., other federal or state programs). Using the Superfund Alternative Approach. US EPA says the Superfund Alternative Approach (SAA), begun in 2004, uses the same investigation and cleanup process and standards that are used for sites listed on the NPL. However at Tremont City Barrel Fill Site, the SAA may have given US EPA Region 5 latitude to ignore Ohio EPA, Clark County Combined Health District, and the public.